Excellent, sophisticated, graceful and cold hardy evergreen tree that thrives in our climate. Large, green pendant leaves are marked with three prominent veins. New growth in spring emerges bright coral red before changing to mid green. Horizontal branching structure in tiers displays the handsome foliage very well. In late spring curious little white/green flowers amuse but are hard to spot. 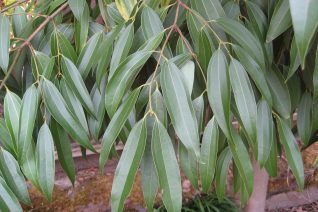 Fast growing straight trunked tree to 25′ tall with a spread half as wide. The crown is conical shaped but becomes more spreading in time. Excellent cold hardiness as well as adaptation to ice and snow. We love this unusual member of the Lauraceae. It should be planted often.